What a wonderful post, Russell. My first memories of curries are from the wonderful Indian restaurants around Auckland, particularly Mount Eden & Epsom. Simla was where our family often went for family dinners, and later on Chaahat (sp?) in Greenwoods Corner was a staple too. I used to take girls on dates to the second-floor 'Rialto Foodcourt' in Newmarket, where I would inappropriately gouge upon whatever delights the Indian stall cooked up. If I recall correctly, the owners at one point were actually Iranians. BTW, who else remembers Jewel of India in the University of Auckland food court? Certainly not the best, but I remember it fuelling me during my AUSA student activist days. Later on, three years in Singapore blew all my curry assumptions out of the water when I was introduced. A year of living in Farrer Park/Little India in an apartment which, if I left the windows open, would echo with the announcements of Mustafa. Me thinks it's time to wrote a blog post about this actually..
uh huh … so you’ll be bringing that to the next wine and food match will you? Tell him not to quit his day job, whatever that is, go on! Now I live in Kuala Lumpur, I am even more blessed with amazing curries. One of my joys in Malaysia are Indian breakfasts. And just the way you can wander most anywhere and find a hole in the wall serving soul-stirring black pepper chicken or a delicious murtabak. Nic, I understand that the Lahore Curry/Kebab House of E1 may have recently closed. Grim news indeed. I also thought that London curry was a bit off when I arrived, but I think now that is because I was relying upon Zone 1 but then I later when to places in Southall or Tooting and the quality there was rather better. I actually started liking butter chicken! Speaking of Butter Chicken, a friend and I went for lunch one weekday to one of the Cuba Street Indian restaurants and as we walked in the door, the waiter's first words to us were "Butter chicken, beer?". I'm not sure what that says about him or us, but we didn't order either, which seemed to disappoint. The most recommended place these days is probably Tayyab's in Whitechapel or nearby Needoo Grill (ex Tayyab's staff). Meat heavy though. For some of that Satya style South Indian joy, Tooting is the spot. I had the fortune to grow up vegetarian, close to an Indian family and the cuisine has been a staple all my life. My earliest restaurant memory is sitting on brightly coloured floor pillows at Ghopal's (?) in Auckland. Satya is my treat on rare visits back from UK. Indeed. 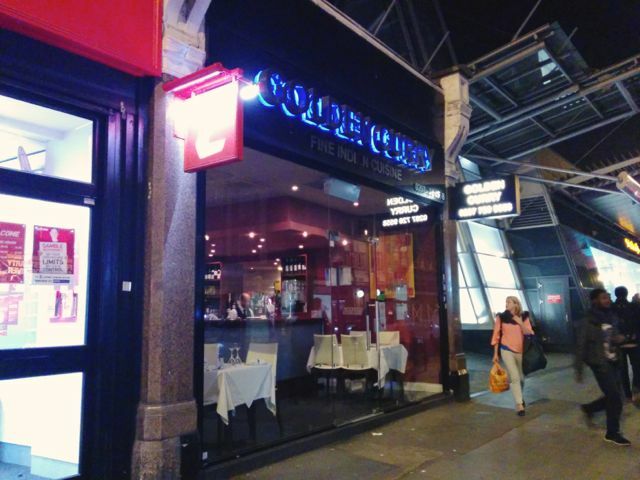 Golden Curry looks like the kind of joint I avoid.. shiny black, chrome and blue neon. Two tables occupied at 9:30 this evening. Oh well. There are always memories. Speaking of Butter Chicken, a friend and I went for lunch one weekday to one of the Cuba Street Indian restaurants and as we walked in the door, the waiter’s first words to us were “Butter chicken, beer?”. I’m not sure what that says about him or us, but we didn’t order either, which seemed to disappoint. My sister went to that restaurant (which would be Tulsi) once with a couple of friends and the maitre d’ asked them when they entered, “So – three butter chickens?” They were appalled and left. However, I was in there once, waiting by the counter, and watched as a group of four people came in and one by one ordered butter chicken for themselves. Was the butter chicken nice? There's definitely good and bad butter chicken, and maybe people went there especially for it? Not uncommon in restaurant trade to have one outstanding dish that gets ordered 10 times more than everything else, at certain times of the day. Food memories are the best. You can recreate them in the kitchen. It's why we cook. Got given the Rick Stein Curry book last year - its the book of the tv series a couple of people have mentioned. It's close to my book of the year for 2013, nudged out only narrowly by Jesse Norman's 'Edmund Burke: the First Conservative'. Currnelty working my way through it: tonight's meal is the lamb & sweet potato curry for which I've used kumara and also bunged in a spoon of ground sumac - I know its usually a fish or chicken spice but I thought it might go well with the kumara. The other favourite is the First Class Mutton Curry: but note that the recipe in the book is quite a bit simplified from the one on the tv programme. My first 'real' curry was aged about 10: the mother of one of the Indian kids in my class came along and cooked us all a meal. Two things stand out: how hot the meal was to the uneducated palate, but also how gorgeous the bread was. In retrospect it was probably some form of bhatura. All I know is I can still taste it. Light, fluffy, not too oily: filling, and warm, stayed on the roof of the mouth and dissolved. This was 40 years ago, and it is still incredibly vivid. [Anyone know the Urdu for 'madeleine cake' or 'in search of lost time'...' ]. Back in the year after I finished Uni and hadn't found a job back in journalism I worked on a gardening gang and the boss (best boss I've ever had, btw) was an immigrant Geordie with a taste for curries. He took us all out for lunch before Christmas to what he reckoned was the best Indian restaurant he'd ever come across in NZ - it was in K Road, almost opposite the Post Office. Lovely rogan josh and fantastic (if very oily) roti. I *still* haven't got to India, but I had some lovely curries in Nepal - the best of which were from roadside stalls. I always found Wellington butter chicken too sweet, so stopped ordering them long since. i can highly recommend this tome by the formidably named pushpesh pant. it's pretty good, and reads a heck of a lot like a set of recipes collected from a diverse range of other cookbooks, and poorly translated. the descriptions are sometimes out of synch, and other times missing key ingredients (which are in the list, but not in the instructions), so it can be a bit of an adventure. have been slowly working my way through the chicken curries, but they seem to have recipes for pretty much anything you can name. it's almost solely responsible for a doubling of space needed on the spice shelf. that said, after awhile you find it's like having 1000 italian recipes - which coincidentally sits next to it on the shelf. If you think Tulsi's butter chicken is too sweet, you probably shouldn't try their mango chicken. Both are pleasant enough, but the mango chicken was almost too sweet for me , and that takes some doing! Blimey! The Moti Mahal in Oxford: scene of many student dinners when I were a lad. Flock wallpaper, the works. I was in Oxford three years ago, but didn't think to check, though I did look down Boulter Street, where I lived for the first half of 1975.